My month schedule is crazy busy. Posting today so I don’t miss August! Ah, August. Tax free shopping weekends and first days of school. Getting us very close to the 100 days till Black Friday mark. Less than 30 days to NCAA kickoff. On last scorching hurdle before we get in to the 'ber' months. Hello, August. Although we have smoke in the air that has drifted from all of the horrible fires in the west, Fall will be in the air soon. I can't wait. Hope everyone is doing well! How is it August already??? Only 3.5 weeks until I have to go back to work. August has arrived! This has really gone fast! Checking in for August! Still in denial that it’s August...yikes! Hope everyone is well. I watched that on the local news last night, winds just snapped that palm tree in half like pencil. Happy August! Brad, where you at buddy? Not crying in a corner over all of these t-shirts I hope, lol. Happy August all! 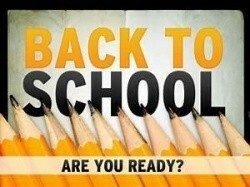 Our kids start back to school on the 15th - when does it start back in your area? Hello August. Started off the first day by taking my son to school. It was the last first day of elementary school for us. Happy August! This year is just flying by. My youngest starts 10th grade on Wednesday so it is last minute getting ready around here. Bring on Friday night football!!! Hello! Starting my new position in the kitchen August 13th! School starts in 2 weeks and I just booked a Disney Christmas cruise for us! I’m so excited I’m a Disney world junkie never been on a cruise and beyond excited I got an awesome deal, anybody ever been ? Happy August everyone! Posting today so I don't forget! Isn't this the time of year we start asking for the first ad? You're not out of the club. You just need to write a haiku to win a prize! We didn't lose anyone in July, so we're still at 49 members. I doubt we'll lose anyone else through November. My wife is a teacher and has been back to work from the start of this week. Daughter starts back on the 13th. Summer is gone except for that horrible heat part of it here lol. Happy August!! Almost time to start thinking about all those ads!